Update! Texture-by-feel Water Bottle…drop-wise versus spray | Engineering Technologies Canada Ltd. Humans have a long tradition of wanting to keep important reference information close at hand. Remember those kids in high school who sneaked “cheat sheets” into exams? Even Sarah Palin tried to use crib notes on her hand to keep on track during a post-speech Q&A session. Well here at ETC/Dynamic Monitors, we believe that it is a smart idea to have site assessment reference materials in a convenient location close at hand…and unlike your cheating high school friends, there is no need to be embarrassed about it! 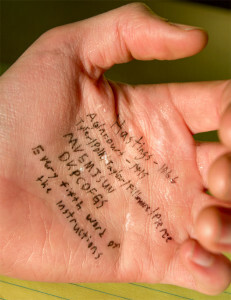 But lets face it, writing on your hand just doesn’t look that professional, and there isn’t that much room. Enter the concept for a Texture-by-feel Water Bottle. Basically my idea was to take the “texture-by-feel” flow diagram (ie. like the one originally developed by Steve Thien*) and adapt it to fit on a waterproof plastic label which would be attached to a water bottle that site assessors could use in the field. Drop-wise water bottle with texture-by-feel diagram printed on wrap around waterproof label. The idea being that we usually have a lot of stuff to carry in the field when doing site assessments, and by placing the flow diagram on a water bottle that we need anyway, it would save having to carry and refer to another item, or flip through a clip board etc. Thien’s method says to add water “dropwise” to soil to get it to the appropriate moisture content to make a moist cast, ribbon etc. We have been using a water bottle with a small flip spout that is a nice size, fits in a back pocket, is durable, leak proof and lets you squeeze out water one drop or a few drops at a time. We have adapted Thien’s flow diagram so it fits nicely around the outside of the bottle. I even added a scale along one side to make it easy to check the ribbon length. Of course the label will get dirty, but being plastic, it can be wiped off easily. Also, assessors probably won’t need to refer to the texture-by-feel flow chart for every soil sample, unless they are new at it, or don’t do site assessments very often. But they would have the flow diagram close at hand (literally) when they wanted to refer to it. However…I have found that some soil scientists prefer and advocate for the use of spray bottles. Personally, I find spray nozzles clog up over time, are awkward to carry, and the plastic spray heads easily get broken in the field or kicking around in a truck, etc. Also has a convenient scale in inches and centimeters for checking the ribbon length. Recommended practice is that the test pit soil profile should always be examined in a moist condition. Well, in some regions of North America (such as the Maritime Provinces of Canada) we receive a significant amount of precipitation, on average 1200 mm (4 feet), relatively evenly distributed throughout the year. So in my 17+ years of examining test pits in this region, I have almost never encountered a profile in which the soil was anything other than moist or wet! But there are regions of the USA and Canada which receive much less precipitation, and drought conditions are common. Site assessors in those areas use a spray bottle to moisten the wall of the test pit so they can examine the soil profile in a moist condition. Since they have that bottle with them in the test pit anyway, it only makes sense to use it for hand texturing samples. So this was a good reminder for me that although the Maritime Provinces are my “little oyster” (sorry, another Maritime reference!) one must always be mindful that climate and geologic conditions can be quite different in other parts of the world, and those different conditions often require different approaches. As a result of the feedback I have received, I am going to offer a Texture-by-Feel water bottle in a spray bottle version as well (see prototype in photo). The bottle would also come with the flip-top cap for those that prefer it, and for better storage to prevent leakage. I am still interested in hearing what type of field water bottle you prefer for carrying out your site assessment work and what type of climate prevails in your region. ps. Label would give credit to Steve Thien through the citing of the reference below. I definitely prefer the flip-top field water bottle for hand texturing over a spray bottle. Your proposed water bottle would be most convenient, and I would much rather have the texture-by-feel diagram to be on the bottle as you have proposed as opposed to having the diagram on a separate laminated card, or just a page in my field manual, or on a clip board. Thanks Philip, I appreciate your feedback. I agree we have enough to carry into the field as it is, so any opportunity to “double-up” is welcomed. Like the idea of the flow chart on the bottle. Hopefully it will have silt on it (missing on some I find…). I do carry around a plastic card with sand samples stuck to it that I find handy when dithering about whether sand is fine or medium. The other aid I tend to use is one of those area coverage diagrams. Certainly easier to refer to a card or the bottle than looking in a clipboard or notebook. Best of luck with the product!! How often do you see pure Silt in your travels around BC? It is my understanding that it is very rare in nature. I have never seen it here in the Maritimes, apart from marine silts in harbours and in flood plains which are usually not good candidates for an on-site sewage systems anyway. I presume this is why Thien ommitted it from his original flow diagram. I like it. Will buy 50 when available. It sure beats spitting on a windy or very hot dry day! Thanks Len, I agree it does sure beat spitting! Are there any regions in Alberta where the climate is so dry that you often need to wet down the test pit wall to view the soil profile in a moist condition?